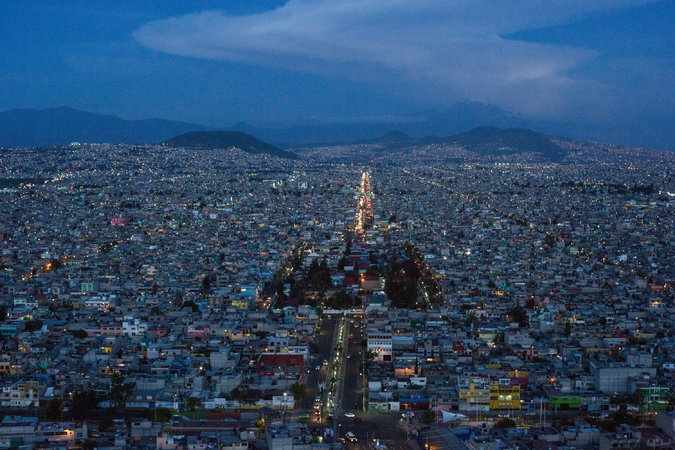 Neza, as it is known, is gritty and working class, a sprawl of short concrete buildings. But it is a quiet success story. As crime and corruption skyrocket nationally, especially in surrounding areas, they’ve remained stable or even declined here. When we asked Neza locals and officials how they did it, they pointed to Jorge Amador, the police chief who looks and talks as if he wandered into the job after getting lost on his way to a faculty meeting. Mr. Amador, whose background is in sociology and water management, imposed policy changes that, sweeping and sometimes eccentric, might be impossible elsewhere. He set up literature programs and chess classes. He restructured the force to emphasize community engagement. He fired 100-plus officers suspected of corruption or brutality. So was Mr. Amador the key to Neza’s success? After some time in Neza (and a lot of time with Mexican academics), we came to a different conclusion. Or, at least, a broader one. Neza’s secret was breaking from the Mexican party system, which is what made Mr. Amador’s hiring and reforms possible. José Amador, the chief of public security in Ciudad Nezahualcóyotl. Mexico’s establishment political parties are beyond troubled. They are a dangerous combination of superstrong — they are tightly controlled institutions that have few career civil servants — and super-weak. They are riven with corruption, patronage and nepotism. They have the power to enforce internal loyalty but not to perform basic institutional functions. “You don’t have any institution or agency that is capable of forcing the parties to cooperate and forcing them to be honest and fair. And that is a huge problem,” said Joy Langston, a political scientist at the CIDE, a Mexico City university. “They are very much able to negotiate reforms that make them even stronger and give them even more distance from voters,” she said, adding that this means parties have shrinking incentive to think about policies that will help voters, or to think about policy at all. Neza is different; it is run by the left-wing P.R.D. party, rather than either of the establishment parties. Most P.R.D. holds are not like Neza. They, too, see upticks in crime and corruption. But because the P.R.D. 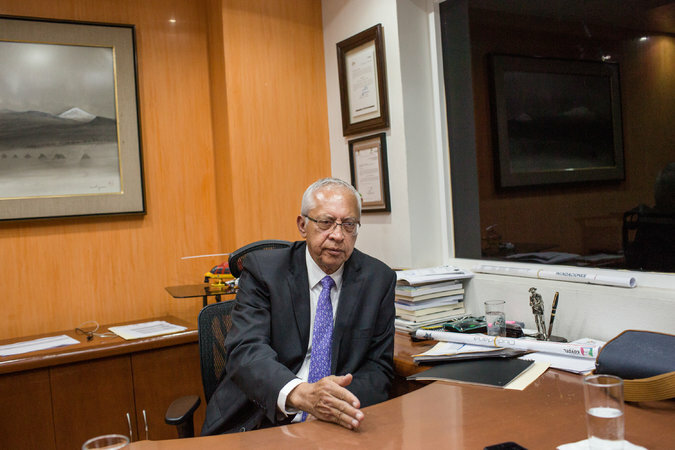 exists outside of the mainstream party system, an official like Mr. Amador is at least freer to root out corruption or experiment with unorthodox reforms. At the same time, however, he cannot turn for help or policy expertise from state or federal institutions. So he is walking a tightrope without a net. And not all of his policies have worked. After years of relatively undisturbed experimentation, Neza has become something like an open-air experiment in social engineering. The goal is to so enamor the police of their civic responsibility that they will decide to refuse the money they could make extorting civilians or aiding drug gangs, as is common in much of Mexico. 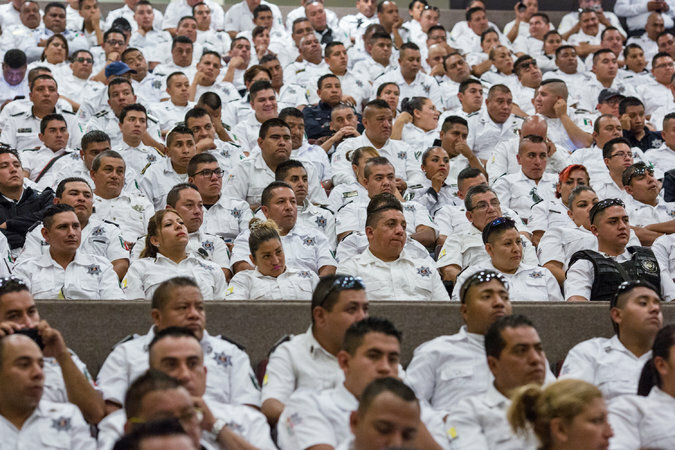 Police officers take part in a ceremony to honor members of the Ciudad Nezahualcóyotl police force. In August, we attended one of the twice-annual awards ceremonies that Mr. Amador holds for the police. Of the 700 officers in attendance, half would receive some sort of prize and cash reward. Family members in the audience waved supportive signs. In an Oprah-style twist, and to cheers even she might envy, six officers were each granted bonuses worth four months pay. It felt like a pep rally. “At the beginning, people don’t trust you, they are very defensive,” said Diana Hernandez, one of the community officers assigned to monitor a small patch of streets — another experiment. Neighborhood watch groups, set up to coordinate with police, are provided with police cameras, alarm systems and direct lines to the patrol cars. In a way, he is seeking to replicate the functions of a political party: grass-roots mobilization, civil society allies and institutionalized policies. It’s a big idea, but a reminder that trying to reform the police and society without real institutional support is a bit like writing in the sand. “It’s fragile, this experiment,” Guillermo Valdés, a former head of the national intelligence agency, said. Establishing it “has been a long process and a slow one,” requiring time and freedom that doesn’t exist for most Mexican officials constrained by the party system. Policing experts we spoke to generally gave Neza high marks, as did Mr. Valdés. Juan Salgado, also with the CIDE, said the city had achieved “great successes,” in part by sidestepping civil society organizations, which, like so much in Mexico, tend to dominated by the establishment parties. Still, not everyone has been sold. Antia Mendoza, a Mexico City-based security expert, said Neza’s officials had not proven a link between Mr. Amador’s reforms and the crime rate. And she saw little proof the community networks were working. An aerial view of Ciudad Nezahualcóyotl. And Neza is hardly an oasis of safety. The day before the police awards, our photographer visited Neza to find the main traffic circle shut down by a public brawl. When we spent some time in the police command center, which includes dozens of new-looking TV screens displaying feeds from hundreds of street cameras, the officers watched helplessly as a car chase zipped across the screens. Still, in a way, the most important thing may not be how well Mr. Amador’s reforms worked but the fact that he had space to try them at all, and for years at a time. That level of freedom, particularly to purge corruption, is rare in Mexican policymaking. It’s a major problem for Mexico, constricting officials in a time of national crisis. That, for us, was Neza’s lesson: not the presence of reforms, but the absence of party-imposed constraints. It made us look differently at the rest of Mexico, where those constraints can be suffocating. It made us think about Europe’s mainstream parties, which are the least popular they’ve been in years, giving rise to smaller and less professionalized fringe parties. It made us think about the global rise in populist parties, which often reject policy expertise and institutions as untrustworthy “deep state” elites. And it made us think about American parties that have been hollowed out by polarization and other factors. Mexico’s political parties are, in many ways, particular to Mexico and its history. They are legacies of the country’s revolutionary past and its recent emergence from single-party rule. The degree to which they are failing is exceptional. But the ways that they are failing are not.